The weather took a positive turn after the horrible cold we had last weekend. When we got up last Sunday morning the thermometer read 29 degrees below zero, the ground was covered with snow, and we started calving heifers. When I drove home from Pierre Thursday evening the temp was in the forties, snow was melting fast, and all the creeks were running. Water was running over the road into the ranch and Olson Creek in front of our house was almost over the road. This is the change we hoped for! The Cowboy Caucus hosted the thirrd annual Testicle Festival, or "Testy Festy," after session Tuesday evening in Ft. Pierre. The Cowboy Caucus includes Sen. Ryan Maher, Sen. Billie Sutton, Sen. Jason Frerichs, and Rep. Troy Heinert. These cowboys rent a house together during session and for the last three years toward the end of session they invite legislators, interns, lobbyists, cowboys, and anyone else with a hankering for good food over to their house to feast on Rocky Mountain oysters (calf testicles to those of you from urban areas), steak tips, onion rings, shrimp, fry bread and wojapi. Rep. Heinert gave the invitation on the House floor, letting us know that they would have a "sack lunch" for everyone. After the laughter following his remarks, an east river legislator seated near me wanted to know what was so funny, so I had to explain what a "sack lunch" was to an urban legislator. If you don't get the joke, ask a rancher. While I'm on the subject of ranch life, HB 1184, my bill to make the "Day of the American Cowboy" an unpaid state holiday on the 4th Saturday in July sailed through both houses of the legislature without a single no vote and has been sent to the governor's desk. Rodeo cowboy Sen. Billie Sutton was the Senate prime and did a great job pitching the bill in the Senate. The South Dakota chapter of the Great Western Cattle Trail Association will be hosting the GWCTA national convention in the Black Hills this July during the Belle Fourche Roundup rodeo and we will celebrate the Day of the American Cowboy in conjunction with the convention. Anyone who is interested in becoming involved in the Cattle Trail Association, our next meeting will be at the High Plains Western Heritage Center in Spearfish at 1:00 on March 17th. It's also Saint Patrick's Day, so don't forget to wear green! 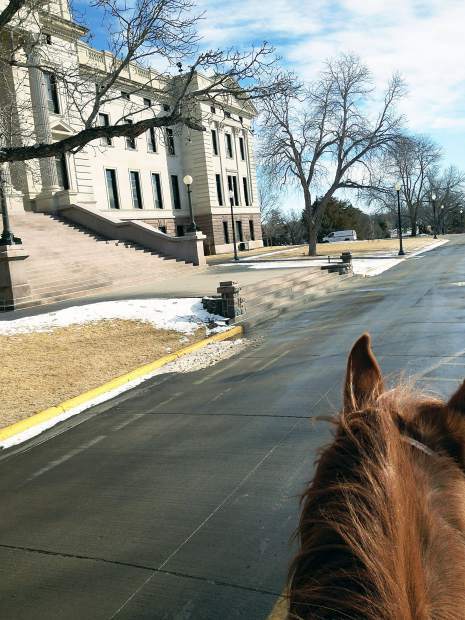 We're headed down the homestretch – only one long week left until the 2014 legislative session is over. Gov. Daugaard hasn't vetoed any bills yet, so we may not even need to go back to Pierre for Veto Day. 45 cents of that dollar goes to education for K-12, higher education, tech schools, and the Department of Education. 39 cents of the dollar goes to taking care of people: Medicaid, Human Services Center, TANF, and DSS/DHS/DOH/SVH. 11 cents goes to protect the public: corrections, the courts, public safety, and the Attorney General's office. The last nickel is spent on the rest of state government: 10 departments, 4 bureaus, the governor and his office, 5 constitutional offices and the legislature. *SB 2 provides for the delayed arrest, under certain circumstances, in regard to outstanding warrants for victims of domestic abuse with minor children. *SB 3 provides for continuity in the judicial review of lawsuits, complaints, and petitions between parties to a petition for protection orders. *SB 7 modifies the persons eligible for protection from domestic abuse and revises terminology. *I brought SB 22 authorizing the issuance of citations for livestock inspection violations to the House Wednesday where it passed unanimously. SB 22 is supported by the Brand Board, the livestock organizations, and producers within the livestock inspection area. I'm pretty sure the governor will sign this needed bill into law. *SB 31 makes an appropriation to reimburse family physicians who have complied with the requirements of the recruitment assistance program and declares an emergency. *SB 74 provides for the consideration of joint physical custody of a minor. *SB 75 prohibits local governments from enacting, maintaining, or enforcing regulations on certain dog breeds. *SB 104 authorizing the use of night vision equipment for hunting under certain conditions. Landowners can now use night vision goggles along with a spotlight to hunt coyotes, raccoons, skunks and other varmints at night. *SB 122 provides for insurance coverage for the treatment of hearing impairments for persons under the age of nineteen. *SB 150 allows the use of supraglottic airway devices by emergency medical technicians, and declares an emergency. *SB 154 establishes the Jolene's Law Task Force to study the impact of sexual abuse of children in this state and to make recommendations to the Legislature on policies to effectively address the issue. *SB 161 revises provisions relating to notice provided by mineral developers. *SB 186 revises electronic driver license renewal requirements and authorizes electronic upgrades of restricted minor's permits.